This is another project that I worked on between the AEDM challenge. This drawing was more difficult than what I’m use to. I don’t have much experience with perspective drawing and I find the that roof was hard to draw. I wanted to throw this away a zillion times, but I kept at and managed to get it done. 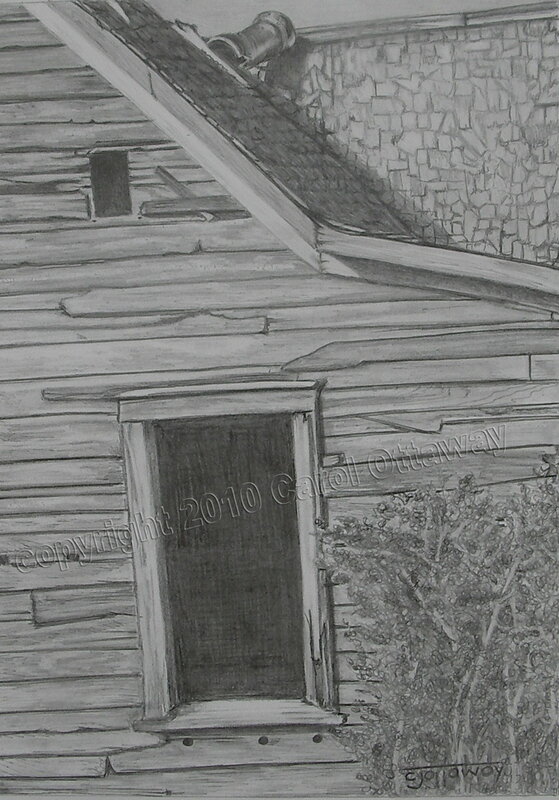 I’m glad I stayed with it, because I think it looks pretty good;) This drawing has a lot of new elements that I have been dabbling in to like the bushes, sky, shingles and a little metal at the top. I hope everyone has a very creative day! P.S. Yes, my image is crooked…UGH! I don’t think I would make a good photographer, would I? This is wonderful! Crooked, yes, but an interesting perspective. this is a wonderful little drawing. The crookedness is actually what makes this drawing so intriguing. Perspective can be adjusted to fit the needs of the artist.